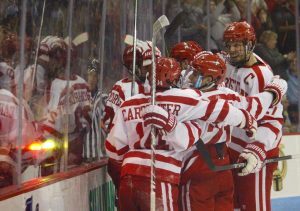 Now that the dust has settled on the Boston University men’s hockey team’s 10-2 win over the University of Prince Edward Island on Saturday night, let’s revisit some reactions. 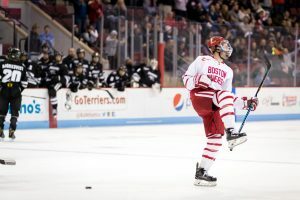 To be exact, we offer three takeaways from a contest in which penalties took over the narrative and fans got a glimpse into the well-oiled machine the Terriers could be in 2016-17. 1.) The goaltender battle – When people think of BU’s roster, odds are they aren’t jumping to the goaltender position. After all, there’s so much on-the-puck talent that it’s easy to forget Coach Quinn has three viable netminders who are all capable of stepping into the crease on any given night. That was exactly the case against PEI. The veteran, Connor LaCouvee, got the nod in the first period, and was bested twice in a 5-on-3 scenarios. Quinn conceded in his postgame press conference that BU hasn’t even practiced 5-on-3 hockey yet, and senior captain Doyle Somerby assured LaCouvee was hardly at fault. The Canadian also made 11 saves, and looked assured from the start. 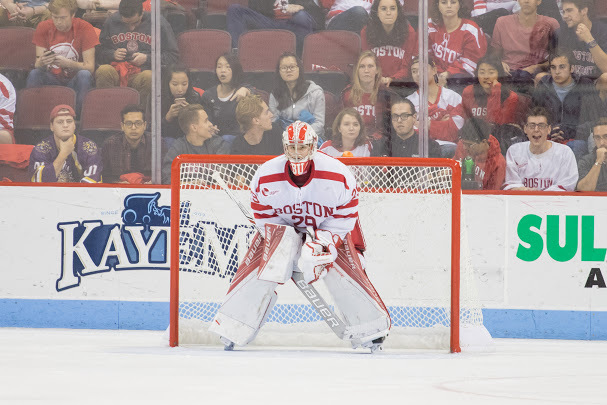 When the second period rolled around, freshman Jake Oettinger got the nod, and he didn’t disappoint, turning aside all seven shots he faced. The U.S. National Team Development Program product never look flustered, and that’s a positive sign. Then came the third period, giving sophomore Max Prawdzik an extended period of live action. Like Oettinger, Prawdzik posted a shutout, stopping the puck 10 times. All things considered, Quinn has an intriguing goaltender proposition on his hands: Who gets the start? Is it the known commodity in LaCouvee? How about Oettinger, who has high NHL Draft potential? What about Prawdzik? As Quinn likes to say, playing goalie is just about stopping the puck. You stop it, you play. Will it all be that simple? 2.) 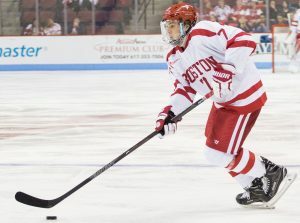 The freshmen – Leading up to BU’s season, I spoke with John Gardner, Avon Old Farms’ head coach, for a New England Hockey Journal article. Gardner has been around the block once or twice, and he spoke glowingly about Patrick Harper, suggesting he could be BU’s sparkplug on offense. Now we all understand why. Harper demonstrated incredible instinct in front of goal and an eye for a pass, finishing with a whopping five goals and two assists against the Panthers. The kid is legit. But let’s not forget that center Clayton Keller put up a hat trick of his own, defenseman Chad Krys tossed out three assists and blueliner Dante Fabbro finished with a goal and an assist. A perhaps unnoticed bit was that winger Kieffer Bellows, the New York Islanders’ first round pick in the 2016 NHL Draft, finished without a point. It’s not that Bellows played poorly, it’s just more that a solid night paled in comparison to his classmates. That’s how productive this nine-member freshmen group can be. 3.) The penalties – Holy cow, I don’t think I’ve ever seen so many penalties in a hockey game in my entire life. 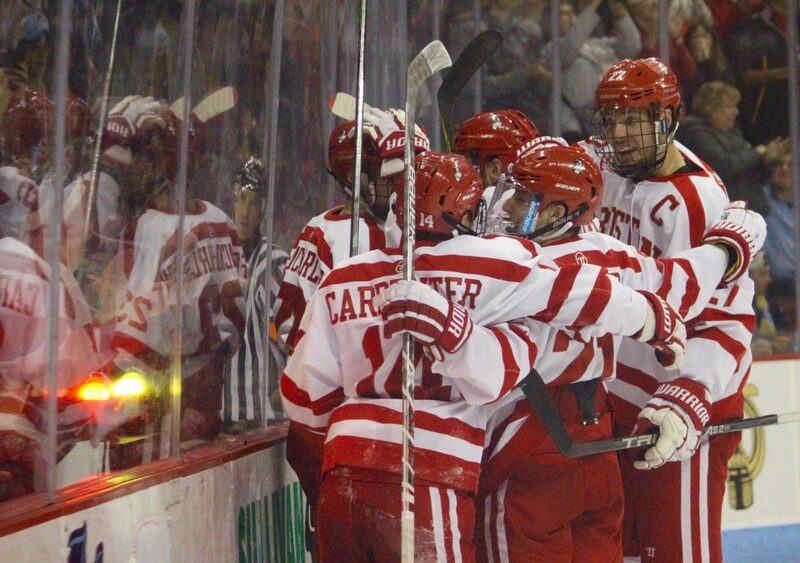 To be exact, PEI and BU combined for 122 minutes in the penalty box, and the refs called the game incredibly tightly. Will this trend continue? Only time will tell. Shane Switzer, normally a defenseman, saw some time at forward. It’s likely not a long-term solution, but intriguing nonetheless. Four forwards – Oskar Andren, Ryan Cloonan, Johnny McDermott and Chase Phelps – didn’t dress last night. We’ll follow up and see if there are any injury updates. BU fans had to love seeing Nikolas Olsson and Nick Roberto back on the ice. Neither made huge contributions, but odds are that won’t be their role this year. 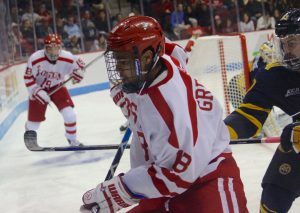 The Terriers could have one of the nation’s best power plays. Few teams can roll out two five-man units as skilled as BU’s. Take this result with a major grain of salt. PEI is no Hockey East or NCAA team, and greater tests await. Namely the U.S. NTDP visits Agganis on Thursday night, and BU visits Colgate University on Oct. 8. Those will serve as far more accurate gauges of BU’s standing. The Terriers got their 2016-17 season underway Saturday night with a 10-2 victory at Agganis Arena over the University of Prince Edward Island. Check out our game coverage on The Daily Free Press, BU’s student-run newspaper. Jonathan wrote up the recap, and there are some interesting quotes from head coach David Quinn and senior captain Doyle Somerby. It’s safe to say the scarlet and white aren’t satisfied with making quick work of a Canadian team in an exhibition match. Meanwhile, Nick wrote up a sider on the freshmen. Forwards Patrick Harper and Clayton Keller were electric, while defensemen Chad Krys and Dante Fabbro showed why they’re so highly touted. You want to give this a read, folks. And last but not least, here’s out tweet of the night. This Patrick Harper kid is quite the jokester. Harper on if he's ever scored five goals in a game before: "Maybe in NHL16." The Boston Hockey Blog crew swung by TD Garden on Tuesday for Hockey East’s media day. 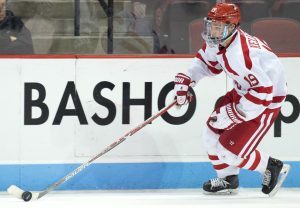 Coaches and captains were in attendance, and the league announced the Boston University men’s hockey team took home the top spot in the preseason poll. 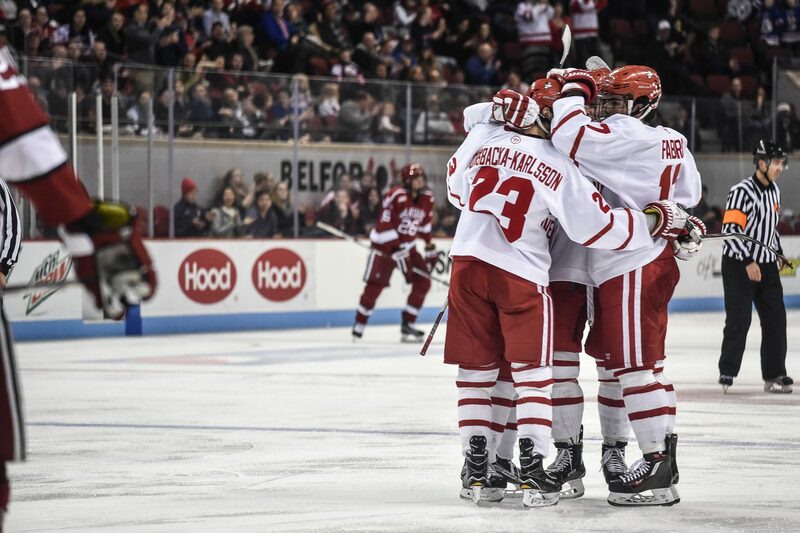 For BU’s purposes, that meant we got some reactions from head coach David Quinn, captain Doyle Somerby and the assistant captains in Nikolas Olsson and Jakob Forsbacka Karlsson. 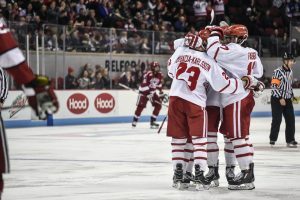 We’re looking to start a BU hockey newsletter. If that’s something you’re interested, feel free to provide some brief information here. The Terriers get their season underway this Saturday with a scrimmage against the University of Prince Edward Island. The game is at 7 p.m. at Agganis Arena. Our annual Hockey Preview goes live next Thursday, Oct. 6. Keep an eye out for a complete, in-depth look at this year’s scarlet and white.